God with Mirror Head, a photo by timtak on Flickr. The Sun Goddess is often depicted as if with a halo, appearing out of a mirror or the sun. 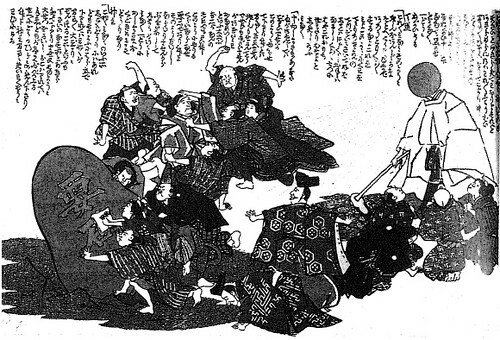 The above Edo period image (Chiba, 2001) depicts the social turmoil after an earthquake in Japan with people put out of work by the earth quake pushing over the cornerstone that keeps the earth stable, thus providing the cause of the calamity that afflicts them. The picture is interesting to me for the depiction of the Sun Godess, or perhaps sun god (referred to in the text as Tendou or heavenly path) who has a mirror for a head. The sun god is holding out a Japanese agricultural implement called a kuwa (a cross between a shovel and a rake, popular to this day) and saying to the peasants who have been put out of work after the earthquake, "Take your shovel-rake and go and get work as a plasterer, which will make money, and earn your living that way." Sober first person views of self, such as Ernst Mach's Field of Vision, may be said to represent the author as headless (see www.headless.org/), or having only a nose for a head! But on the other hand, metaphorically at least, Mach's picture, or one like it, is at the place where my head should be. Mach's picture should be spherical or elliptical. A pure experience of the visual field, a transcendental meditation of sorts, might be represented by the deity in the image above, with a mirror for a head. Munetada Kurozumi, the founder of the Kurozumi faith, claims that the heart of humans is a mirror of the Sun Goddess. Nishida, Watsuji and perhaps Hamaguchi (of "Kanjin" 間人 fame) may be argued to be suggesting that the human psyche is a space. Chiba, K. 千葉慶. (2001). アマテラス=明治天皇のシンボリズム : 明治初期における民心収攬の政治学. 千葉大学社会文化科学研究科研究プロジェクト報告書, 第57集 若桑みどり編『権力と視覚表象(2)』所収, 58–94.